Natalie, our vivacious Practice Manager is the ‘smiling face of North West Physiotherapy’. Natalie has been with the practice since 2005 and in 2010 received the Employee Excellence Award at the Quest Business Achiever Awards, an incredible achievement reflecting her dedication and professionalism. Responsible for the day-to-day running of the practice, Natalie works closely with the entire team to bring you the best standard of patient care from the minute you walk through the door. 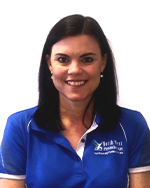 Natalie has completed her Certificate IV in Business Administration and enjoys spending time with her family of four.